Indian River’s softball squad joins hands before the game, knowing the South Division title was on the line. If you did the math beforehand, you kind of had a feeling about the significance of Tuesday’s Henlopen Conference South Division contest between the softball teams of Caesar Rodney and Indian River high schools. Coming into the game, the Indians were 9-3 in Henlopen Conference games (4-2 in the South Division). Lake Forest was breathing down their necks, at 8-3 in the conference (5-1 in the South Division). Essentially, a win for the Indians, and they would win the South Division title. 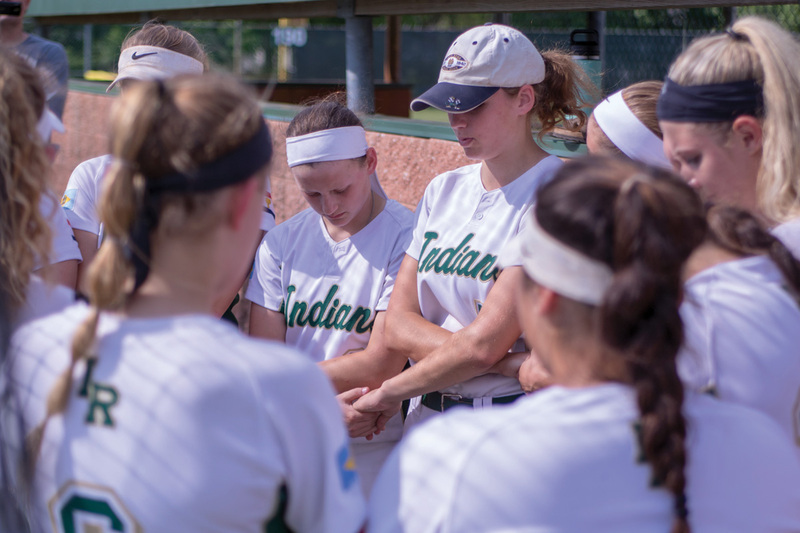 Thanks to the combined pitching of Abby O’Shields and Izzy Allen, as well as the timely hitting of Katherine Collins, Grace Snyder and Braydee Whitman, the Indians put an exclamation point on the game with a 6-0 win over the Riders. O’Shields was dealing from jump street in this one, starting the game with two strikeouts. She would strike out at least two in each of the first four innings before leaving the game at the fifth inning with 10 for the day. Allen came in and picked right up where O’Shields left off, striking out her first batter. IR got all of its offense in the fourth inning, when they sent 11 batters to the plate, but the biggest of the blows was Collins’ grand slam to deep left-center field on a 3-2 pitch to get the Indians on the board. Kaylah Briddell, Damya Williams and Morgan Bomhardt each singled to load the bases before Collins cashed in. Before the Indians could all catch their breath from celebrating, catcher Grace Snyder (2-for-3) jacked the first pitch she saw to nearly the exact same spot, over the left-center field fence, to make it 5-0. Julie Bomhardt (2-for-3) then lined a one-out single, stole second and moved up to third on the overthrow. Whitman singled past the third baseman to allow Julie Bomhardt to walk in with the final run of the inning. And to come up with the big hit to help the team to the division title made it even sweeter. “This is amazing,” Collins continued. “We didn’t think we really had a chance after losing to [Sussex] Central. It’s an amazing feeling to get” the division title, she said. With the division crown in tow, the “one-game-at-a-time” mentality is their sole focus from here on out. The official seedings for the state tournament were set to be released on Wednesday, May 16, after Coastal Point press time. For an update on the seeds and when the Indians (13-5 overall) will open up play in the state tournament, check out the Coastal Point sports Facebook and Twitter pages.